Muscles for Charity originated in Suffolk, UK, during 1998 when a small group of volunteers decided to use their life skills and time to assist other people, provided a donation was made to a registered charity. 2018 represents our 20th anniversary. Muscles for Charity never handles any money. Muscles volunteers work to the highest possible standards, and team members share their specific skills (construction, woodwork, tree surgery, general garden work etc.,) and, on many occasions, are led by a professional builder with over thirty years experience. By Autumn 2018 the voluntary groups had completed over 400 projects, benefiting 128 registered charities in ten different countries and contributing over 15,300 voluntary hours. Following the success, fun and friendship generated by the originating group there are now Muscles for Charity teams in the United States, Belgium, Canada and a second UK team based in Cheshire. Building patios, clearing gardens, painting houses, erecting fences and promoting awareness of charities, international friendship and co-operation and never handling any money are the cornerstones of the award winning teams. Volunteers absorb their own travel costs to projects, and in most circumstances projects are within 15 miles of the team’s base. There are however many occasions when volunteers travel considerable distances to benefit registered charities and support their fellow team members. Visit the national team’s activities and details of our projects and archive at this website. Public and employers liability insurance for team members working on UK muscles projects is Zurich Insurance via the Community Action Suffolk. Muscles for Charity annual insurance covers volunteers for non hazardous activity and public liability courtesy. Insurance cover is available to view by contacting Muscles co-founder, Bernie Morgan. Muscles is also a subscribing member of Community Action Suffolk. 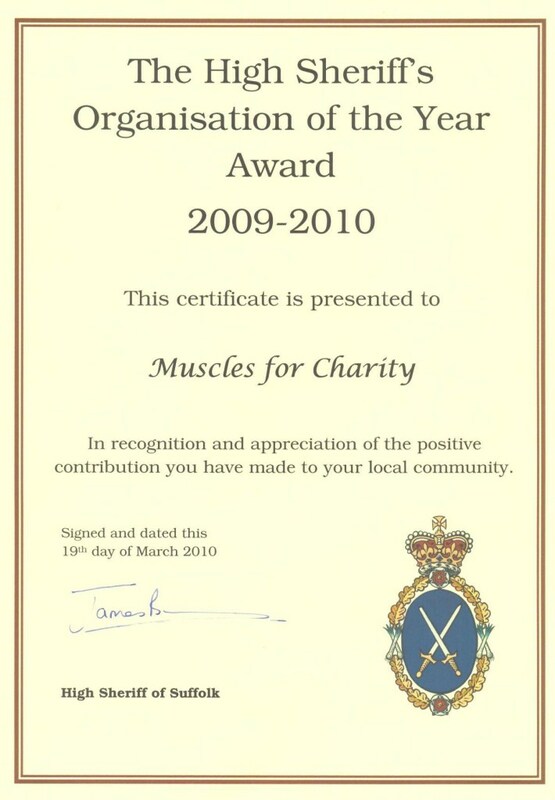 Muscles for Charity volunteers have been recognised with a variety of awards, including the 2010 ‘High Sheriffs Award’ in England for the team’s contribution to the local community. 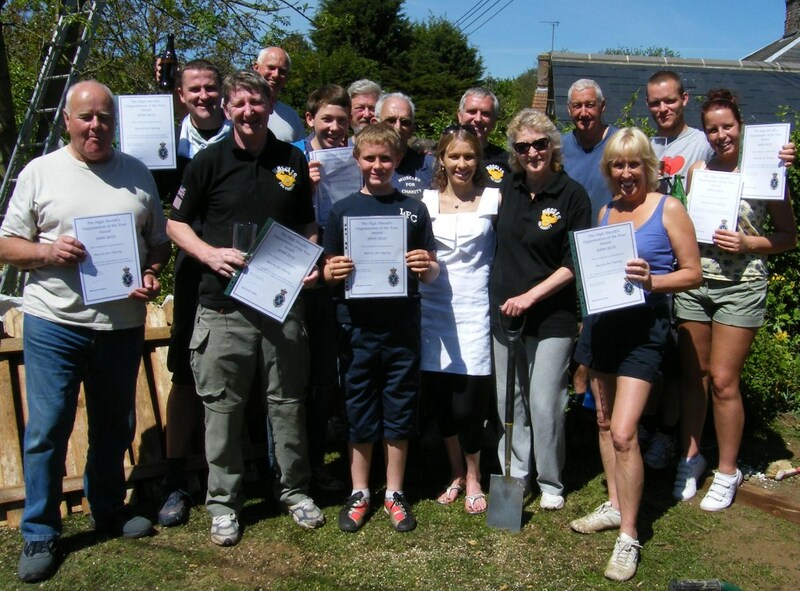 The picture features the certificate and the UK (Suffolk) volunteers. MUSCLES FOR CHARITY – OUR CORE AIMS AND WORKING STRUCTURE. 1. MFC undertake projects that will ultimately benefit registered charities. This can be achieved by either working directly with the charity or by working with a client who will make a donation to a charity or charities. 2. At the discretion of its volunteers. MFC will do work for a client who is unable to undertake the work themselves and who does not have the means to pay professionals. In this case a donation to a registered charity may not be expected. 3. When MFC works for a client then the client specifies the recipient charity. MFC never specifies the size of the donation but expects it to be commensurate with the amount of work undertaken by the volunteers and the circumstances of the client. 4. The client will be responsible for procuring all material and any specialist equipment needed to undertake the work but MFC will advise quantities and types of materials, as well as potential suppliers. 5. MFC arranges insurance to meet all public liabilities and ensures that all members are covered whilst they work on the project. 6. MFC never handles any money, however in the UK, members raise money to buy and maintain tools that are needed for general use. This fund is also used to recompense volunteers for any tools that may be damaged or require repair. 7. All potential projects will be assessed by MFC to check their suitability to MFC’s ability to complete the work in a timely and professional way. At this stage MFC may undertake preparatory work and advise the client of materials and equipment required. In addition both MFC and the client will confirm expectations in writing. 8. Wherever possible MFC anticipates the client will provide some form of refreshment for the duration of the work undertaken as well as giving access to toileting facilities. 9. MFC reserves the right to cancel a project if it feels that the client has issues which conflict with MFC’s ethos of always doing a professional job based on friendship, humour and passion. 10. MFC always strives to meet the client’s agreed expectations and ensures that the promised donation to a registered charity (or charities) is made. 11. MFC will not pay any personal expenses that may be incurred by volunteers.